If your artwork was prepared on the computer, I find it helpful to mirror-image the artwork and print it on paper about twice the size the rubber stamp will be. While carving, I can look at this "blow-up" to remind myself how the tiny details are supposed to look. If you used the inkjet-on-plastic method of transferring the image and you rest your hand on the surface of the rubber while cutting, the inked image on the rubber will smear. You can try to be careful, and you might get away with it on simple designs. Once you get into intricate designs with lots of cuts, though, you'll find that the ink gets so smeared halfway through the job that you can't see where you're supposed to be cutting any more. So, before you begin, find some blocks that are 1/8" thicker than your blank rubber stamp assembly. You can use pieces of wood, books, whatever. Set these down on your work table and lay a clipboard down on top of them. Rest your arm on top of this clipboard. Slide the blank rubber stamp under the edge of the clipboard, and carve just off the edge so that your hand never touches the surface of the stamp itself while carving. Parents need to be concerned with their kids carving rubber stamps because of the sharp tools involved. You might note that the gouges are every bit as sharp as the razor knives, they just don't look as dangerous to the casual observer. Any child using either tool should be supervised. The warnings on the packages seem to indicate that children under age 10 shouldn't be using these tools. I'd suggest they're being overly cautious, children a bit younger than that might very well be mature enough to use such tools safely, but obviously you should judge the maturity of your own child and decide accordingly. When carving with the razor knife, you always want to hold the blade at an angle, so the rubber remaining is narrowest at the inking surface and gets broader below. And you must constantly keep in mind which way is which, otherwise you may undercut some of the rubber inking surface. If you're right-handed, you generally want to always have ink to the right side of your cut. When you are cutting the other side of the pattern, turn the block around. If the cut curves, you'll want to be rotating the block on the table with your other hand as you cut. You'll eventually need to learn to cut with the blade moving either towards you or away from you. At first, make as shallow a cut as you can make, just barely scratching the surface of the rubber with the very point of the blade. Go over the entire pattern that way before making any deep cuts or removing any rubber at all. While cutting, remember that the location of the blade is less important than the location of the edge of the blade. In fact, you can often cut tiny zig-zags without lifting the knife; just twist, and it'll push the rubber out of the way as it cuts sideways. You may be tempted to cut a little on the safe side with the intention of coming back and trimming closer later. Don't do it! The first cut you make will always be the best cut you make. Coming back later to remove a sliver never seems to work well. Try to make your first shallow cut exactly where you want it. As you cut, think about the image you are creating. In many cases, what you want to do is copy the inked pattern as closely as you can. Sometimes, though, you can make subtle alterations as you go. For example, straight lines sometimes look a bit jagged when printed by a computer, but you can easily make them perfectly smooth as you carve. You can also opt for style over accuracy of cut in some cases. For example, if you're carving an image of gravel or wrinkled clothing or something like that, the edges should look a bit jagged, so you can cut in short, jerky motions to give it realism, or even twist the knife back and forth as you cut. On the other hand, if you're supposed to be making an image of a party balloon, it needs to be quite smooth even if it isn't exactly the same outline as the original, so making one long sweeping cut is best. For the most part, you'll have your best luck cutting freehand. Note, though, that in some cases you can make use of a template or straightedge. If you don't have one, you might want to purchase an eraser shield. This is a small rectangular piece of thin stainless steel with various shaped holes in it; it's available where drafting or graphic arts supplies are sold. You can make a pretty nice straight line by holding the blade at one angle, running down the edge of the eraser shield, then tilting the blade the other way and going down it again without ever moving the eraser shield. Make both cuts really light; come back and cut them deeper later without using the eraser shield. For jobs like this, it helps that the straightedge or template is really thin, which is why the eraser shield is ideal. Besides the eraser shield, you can use plastic templates. Because the side of the blade is held against the plastic, it won't cut into the plastic if you're careful. Carving an image of a point require a special mention. This involves two cuts, one for each side of the pointed object, that cross at the point. Making the first cut is simple enough. If you try to begin your second cut at the point, you'll find that your first cut now allows the rubber to distort while you're cutting it. The point in your image will look ratty. To make a clean point, your second cut must end at the point. Even done properly, it is still very important that both of these cuts are very shallow, made with only the very tip of your blade. Come back and deepen them after all the shallow cuts have been completed. You also want to make sure that such cuts continue some distance beyond the intersection. Because you're holding the blade at an angle, cuts that intersect at the surface haven't yet intersected underneath. By extending your cut for perhaps an eighth of an inch, the intersection will be truly completed. Carving an object with two pointed ends means your second cut must begin in the middle for both ends. This is easier than it sounds, because it's actually very easy to begin a cut and go one direction and then come back to where you started, reinsert the blade into the existing cut, and begin cutting in the opposite direction. Finally, if you have two cuts that intersect at a sharp point and extend the cuts properly so they fully intersect, after you remove all the excess rubber you'll find you've left a sharp ridge that tapers down and away from the printing surface. You need to cut this little ridge away; if left in place, it tends to make little wiggly stray marks at the ends of your image. When you're doing the initial shallow cuts, add a slice right at the tip of the point going across the other two cuts. Deepen this cut just as you do the others, and when removing rubber remove all the excess rubber beyond the points. Alternatively, you can try making the slices across the tips first. Then it doesn't seem to matter which direction you make the other cuts; the cross slices give you a square end to begin at. After making all your shallow cuts, Speedy-Stamp will look like you haven't done anything; you'd have to distort the rubber to cause the cuts to open up to see anything. Now it's time to start removing rubber. Go back over the pattern and cut deeper; the shallow cuts will guide the blade, so these cuts are really easy to do. The final depth of each cut will depend on how far away the adjacent cut is; if it's close, the cut needs to be just deep enough that the cuts meet in the middle and the piece of rubber falls out. If the adjacent cut is farther away, cut deeper to get the cuts to meet. If the adjacent cut is more than 1/4" away or so, forget about trying to get the cuts to meet in the middle, you'd have to cut too deep; you'll have to remove this rubber by carving a series of vee cuts with the X-acto and removing successive strips. Or, you can use a gouge and start digging grooves. You will find that, with a bit of finesse, you can get one side of a gouge to follow the initial shallow cut made with the X-acto knife. It often helps to hold the gouge at a very steep angle, pointing down at the surface, so that one top edge, rather than the sharp end, is following the shallow cut. It may feel like you're hacking the rubber out rather than properly slicing it out, but it works great and you don't really care what the surface looks like down in the recesses where you're removing rubber. You might want to have a pair of tweezers or hemostats handy for pulling little bits of rubber loose, and possibly a dental pick, a large sewing needle or pin, or a toothpick for lifting bits up while you cut under them. Poking the back end of a small sewing needle into the eraser on a pencil makes a usable tool. The best tool of all for this job, though, is a carving needle; about 16 gauge works well. You can use it as a pick, but you can also use the sharp edges on it to cut underneath a chunk of rubber to get it to come loose. In fact, if you suddenly realize you forgot to make a cut with the razor knife, you can just go ahead and make the cut with the needle without even having to pause to switch tools. If you're in the comfort of your own home and using a stamp on a perfectly flat surface such as a desk, you can cut away the merest sliver from any part of the rubber stamp surface and that area will not transfer any ink to the paper. When you're standing on a jagged rock holding a worn log book in one hand and stamping with the other hand while trying to hold the umbrella to keep the rain off, you'll find that the paper being stamped might lift up around the outline of the image and pick up stray marks. So, once you've completed carving the image itself, cut away the excess rubber at a steep angle all the way around the outline of the image. For similar reasons, if there are any large open areas within your image, cut the rubber pretty deep there. 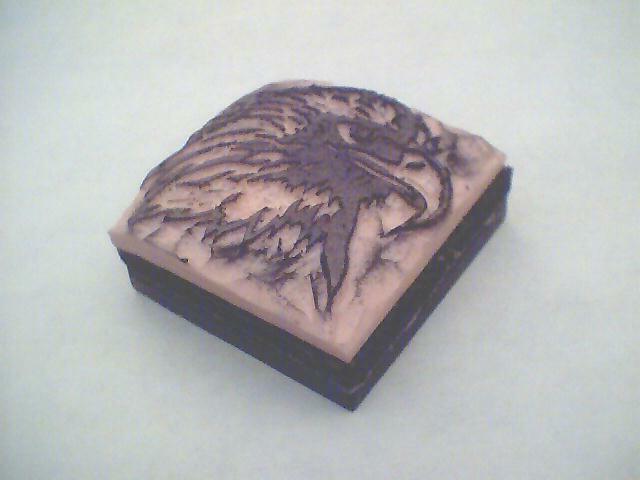 Sometime after you've made all the initial slits with the razor knife, open up an ink pad and make a trial stamp. At this point I prefer to use a cheap dye ink pad because I may end up doing more carving, and I might get ink on my fingers carving a stamp that's been inked. The dye ink washes off pretty easily. Once you start using an ink pad it's a good idea to have paper towels at hand. You might wait until the stamp is completely done before making the first trial stamp, but in many cases it's better to do it sooner, while there are still chunks of rubber to be removed. The ink on the surface of the rubber makes it easier to see how the image is coming along. You must wait until all the slits are made, though, because the image printed on the rubber may be obliterated. Once you're pretty confident that the stamp is complete, make a trial stamp using a good ink pad. I recommend a Brilliance Dew Drop; the ink is first rate, especially the "Graphite Black" which is blacker than just about any other stamp ink. You should always use a quality ink pad with your stamps; a cheap ink pad may result in a blotchy image, giving you the impression that your carving job wasn't as good as it really was. Transferring the image to the stamp blank.